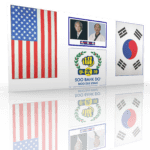 The Discover Soo Bahk Do® Membership Drive 3.0 runs June 1st to October 31st, 2018 and features some exciting new offerings and opportunities. I invite you to participate in and support the 2018 Membership Drive and help us increase public awareness of Soo Bahk Do® in your local community and support your school. You can help accomplish the Federation's chartered purposes by connecting new students to the Federation as members early in their training and by extending your own membership into the future. There is no better time than the 2018 Membership Drive to become a member or to extend your membership. 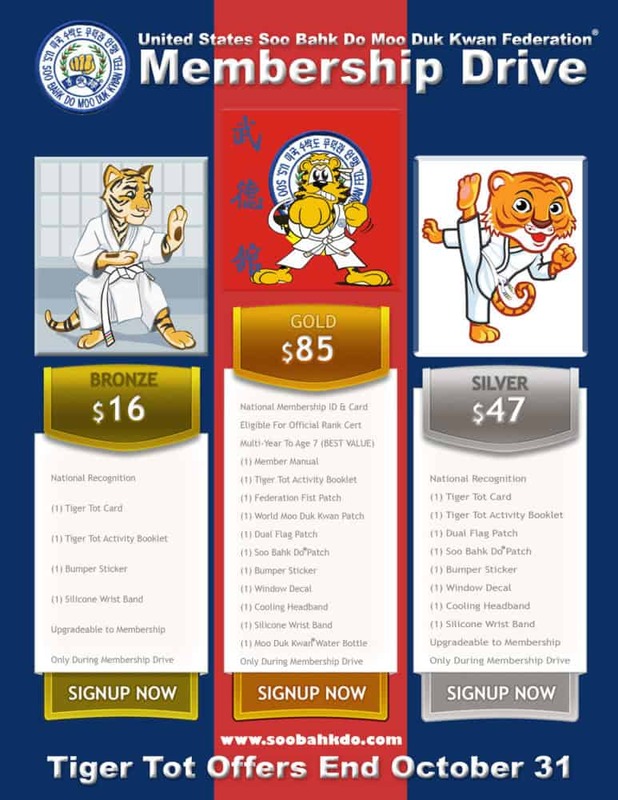 The new Tiger Tots training kits provide our youngest practitioners with age appropriate philosophy lessons and official Tiger Tot gear they can sport on the mat, outside the dojang and in public at school. 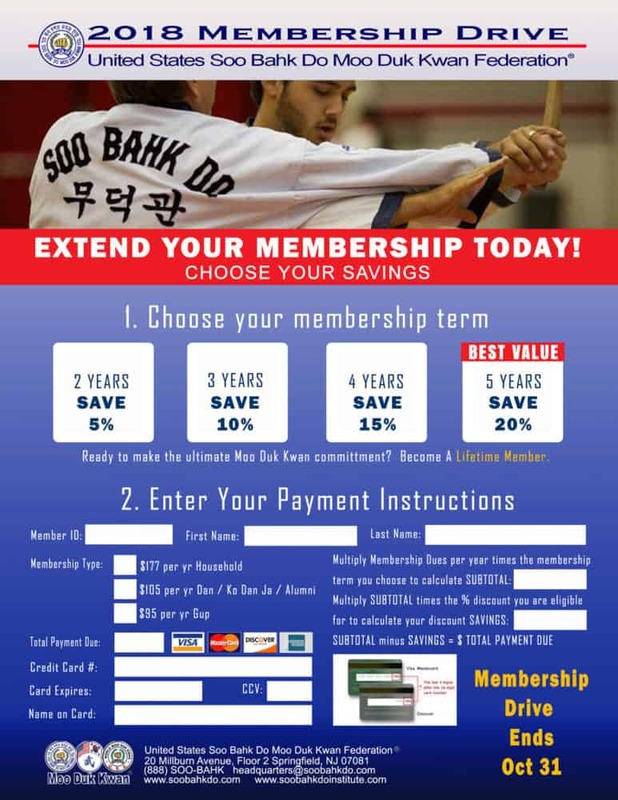 During the 2018 Membership Drive, multi-year and Lifetime Memberships provide more value than ever for members who have already made a long-term commitment to the Moo Duk Kwan® and Soo Bahk Do® in their hearts. Gups who extend membership into the future enjoy the savings indicated on the form PLUS avoid the $10 membership increase when becoming a Dan provided the Gup membership is extended far enough into the future. For example: A 1st Gup Red Belt member testing for Dan within a year will become subject to $10 increase to Dan membership rates UNLESS they have extended their Gup membership for 2 or more years during the 2018 Membership Drive in which case they will not experience the $10 increase to Dan Membership until their extended Gup membership expires. The 2018 Membership Drive provides some great opportunities for all members! Lifetime Memberships wil increase to $1800 effective Jan 1, 2019, but during the 2018 Membership Drive you can get one FREE. 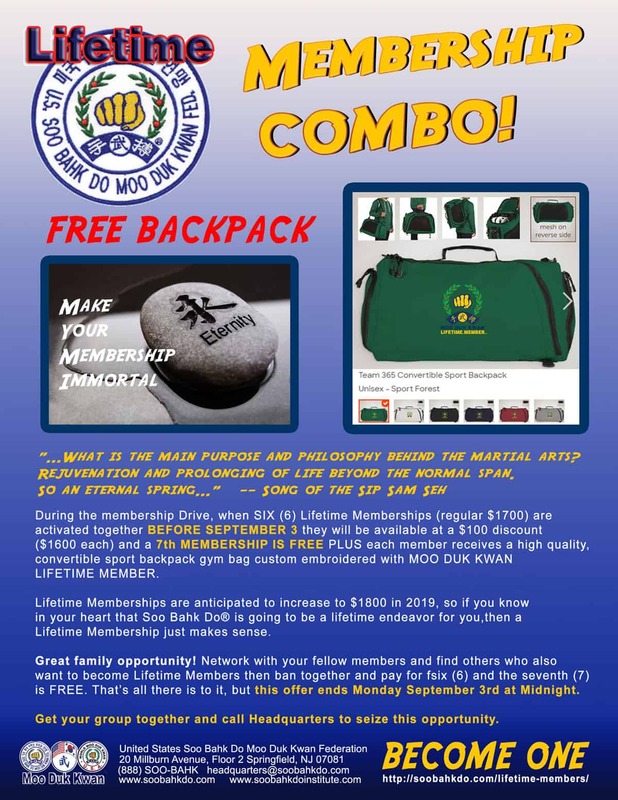 That's right, network with fellow members and during the Membership Drive, when six members activate (6) discounted $1600 Lifetime Memberships together, then the 7th Lifetime Membership is FREE and each members gets a custom embroidered Lifetime Member convertible sports backpack/gymbag. 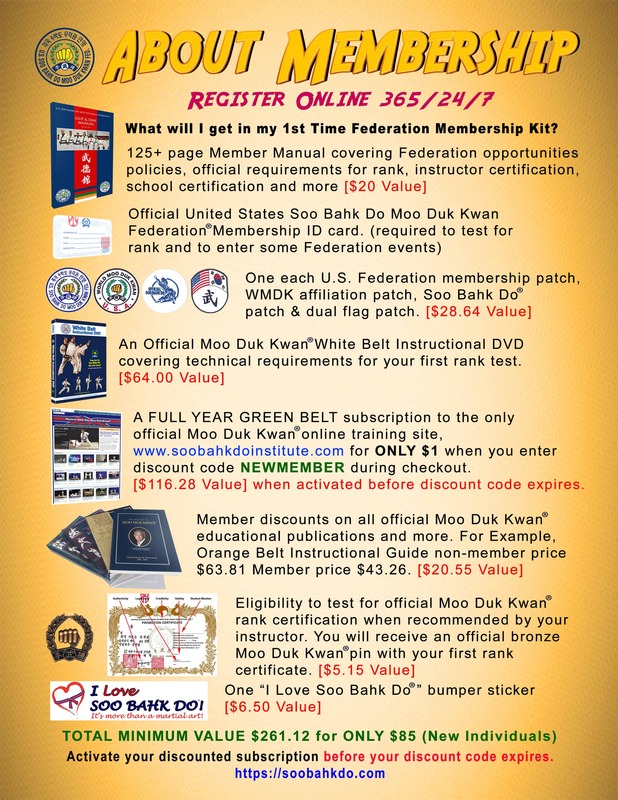 During the 2018 Membership Drive, motivated members who start a new Moo Duk Kwan® Certified School receive all the normal benefits of Moo Duk Kwan® school certification PLUS several much needed accessories to help make a good public impression. 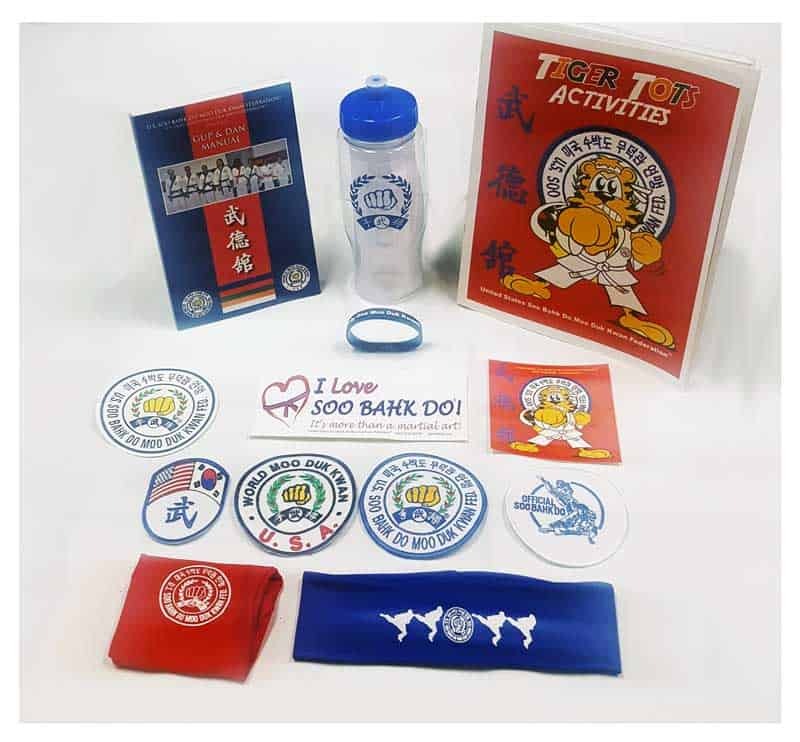 These bonus school tools are valued at $1177 and are available during the Membership Drive at no additional cost for new school certification applicants. 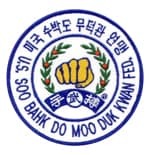 From humble beginnings in Japanese occupied Korea, Hwang Kee founded his Moo Duk Kwan® martial art organization (military, virtue, institute) in Yong San Ku (Seoul), Korea on November 9, 1945 where he began teaching his unique martial art system. 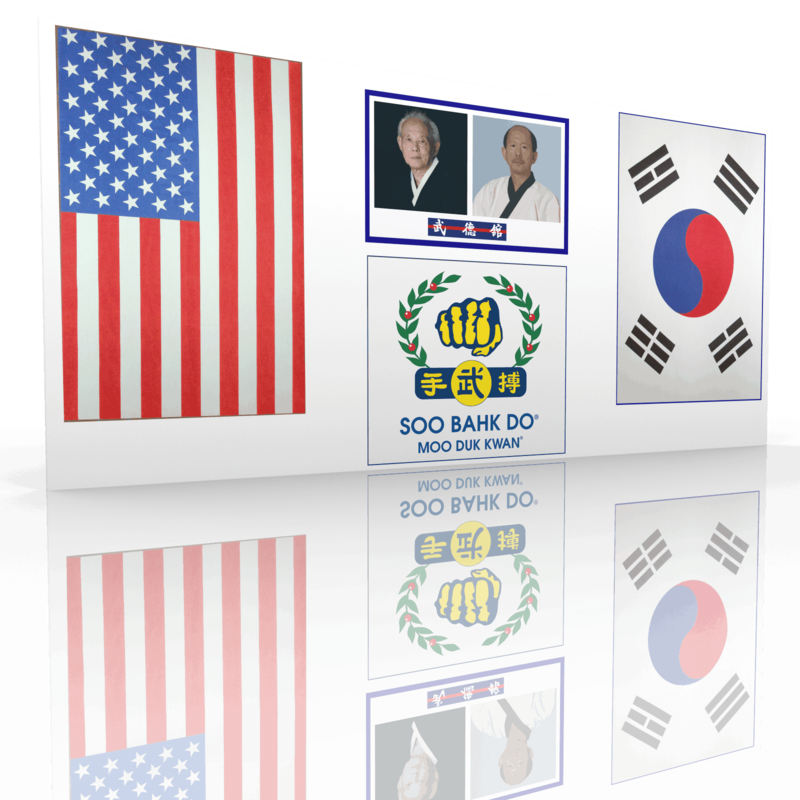 He soon became one of the most widely renowned and respected martial artists in Korea and ultimately in the world after the Korean war ended. Since its inception in America in 1976, the U.S. Federation has preserved and promoted public understanding of and practice of Hwang Kee's martial art system. We invite you to join us! 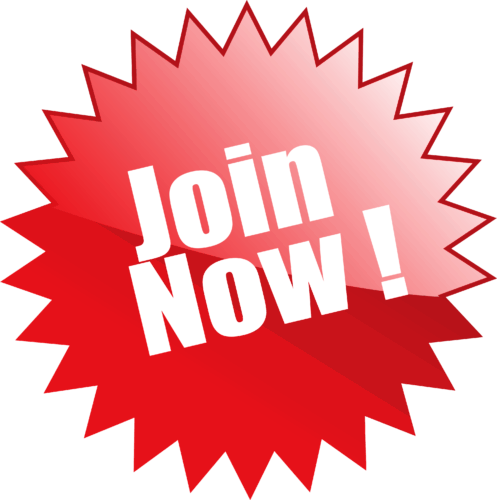 Register now to receive your membership drive bonuses. Activate or renew your new membership for multiple years and SAVE! Become a Lifetime Member along with six friends and SAVE! Get the 7th Lifetime Membership free and each member gets a custom embroidered Lifetime Member convertible sport backpack/gymbag. If your life goals include teaching or running a school, consult your certified instructor about the bonuses valued at $1177 that new schools get during the membership drive.